Narek Hakhnazaryan was awarded the Gold Medal at the 2011 XIV International Tchaikovsky Competition, the most prestigious prize given to a cellist. 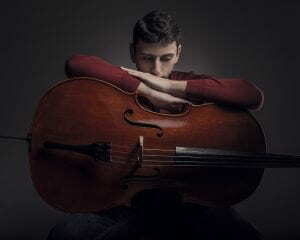 Hailed a “seasoned phenom” by the Washington Post, and praised for his “intense focus and expressive artistry” by the New York Times, Hakhnazaryan has since established himself as one of the finest cellists of his generation. In 2014, he was invited to join the prestigious BBC New Generation Artists scheme. Hakhnazaryan has played with some of the world’s finest orchestras including the Chicago, Detroit, London, New Zealand and Toronto Symphonies, the Rotterdam, Seoul, London, Czech and Helsinki Philharmonics, the Mariinsky Orchestra, the Filarmonica della Scala Milan, the Orchestre National de Toulouse, the Los Angeles Chamber Orchestra, and the Orchestra of St. Luke’s, and with conductors such as Gergiev, Valcuha, Koopman, van Zweden, Sokhiev, Neemi Järvi, Spivakov, Pletnev, Robertson, Belohlávek. In chamber and duo recitals he has performed in halls such as Salle Pleyel (Paris), Wigmore Hall, Berlin Konzerthaus, Vienna Konzerthaus, Royal Festival Hall (London), Amsterdam Concertgebouw, Oji Hall Tokyo, Jordan Hall (Boston) and at the Aspen, Ravinia, Tivoli, Lucerne, Mecklenburg-Vorpommern, City of London and Verbier Festivals. Mentored by Mstislav Rostropovich, Narek was the only cellist invited to travel on behalf of the Mstislav Rostropovich Foundation. As First Prize winner in the 2008 Young Concert Artists International Auditions, Narek debuted in the Young Concert Artists Series in New York at Carnegie Hall, and at the Kennedy Center in Washington, DC. Narek was born in 1988 in Yerevan, Armenia, into a family of musicians: his father is a violinist and his mother is a pianist. His early studies were at the Sayat-Nova School of Music in Yerevan with Zareh Sarkisyan. At the age of 12, Narek began studies at the Moscow Conservatory with Alexey Seleznyov, and went on to work with Lawrence Lesser at the New England Conservatory of Music in Boston.